Peptide (C)EMRNEDVSEVAKD, corresponding to amino acids residues 388-400 of rat SERT (Accession P31652). 4th extracellular loop. 1-2. Anti-Serotonin Transporter (SERT) (extracellular) Antibody (#AMT-004), (1:200). 3-4. Anti-Serotonin Transporter (SERT) (extracellular) Antibody, preincubated with the control peptide antigen. Immunohistochemical staining of immersion-fixed, free floating mouse brain frozen sections using Anti-Serotonin Transporter (SERT) (extracellular) Antibody (#AMT-004), (1:400). A. SERT (green) was visualized in axonal fibers of the hippocampal dentate gyrus. 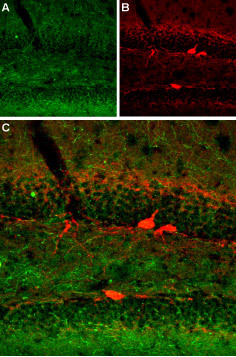 B. Axonal fibers of neurons expressing gamma amino butyric acid (GABA) were labeled with mouse anti parvalbumin (red). C. Merge of the two images demonstrates separate axonal processes (no co-localization). Immunohistochemical staining of immersion-fixed, free floating rat brain frozen sections using Anti-Serotonin Transporter (SERT) (extracellular) Antibody (#AMT-004), (1:400). A. SERT (green) was visualized in axonal fibers of the rat hippocampal CA1 region. 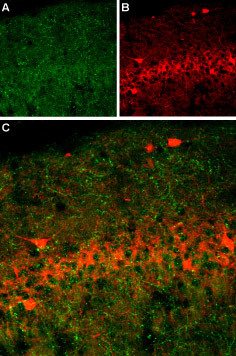 B. Axonal fibers of neurons expressing gamma amino butyric acid (GABA) were labeled with mouse anti parvalbumin (red). C. Merge of the two images demonstrates separate axonal processes (no co-localization). ___ Cells + Anti-Serotonin Transporter (SERT) (extracellular) Antibody (#AMT-004), (1:25) + goat-anti-rabbit-Cy5. Cell surface detection of serotonin transporter in live intact rat pheochromocytoma PC12 cells. A. Cells were stained with Anti-Serotonin Transporter (SERT) (extracellular) Antibody (#AMT-004), (1:100), followed by goat anti-rabbit-AlexaFluor-594 secondary antibody (red). B. Cell nuclei were visualized using Hoechst 33342 (blue). C. Live view of the cells. Haenisch, B. and Bönisch, H. (2011) Pharmacol. Ther. 129, 352. Ramamoorthy, S. et al. (2010) Pharmacol. Ther. 129, 220. Kim, D.K. et al. (2005) Neuropharmacology 49, 798. Mathews, T.A. et al. (2004) J. Neurosci. Meth. 140, 169. Gainetdinov, R.R. and Caron, M.G. (2003) Annu. Rev. Pharmacol. Toxicol. 43, 261. Greengard, P. (2001) Science. 294, 1024. Miller, G.W. et al. (1999) Trends. Pharmacol. Sci. 20, 424. Amara, S.G. and Kuhar, M.J. (1993) Annu. Rev. Neurosci. 16, 73. Carlsson, A. (1987) Annu. Rev. Neurosci. 10, 19. Many physiological, endocrine and behavioral functions are determined and regulated by monoamine signaling1,2. Many brain disorders such as depression, drug abuse, schizophrenia, attention deficit hyperactivity disorder (ADHD) are caused by the malfunction of monoaminergic transmission1-3. The intensity of monoaminergic signaling is determined by the availability of the monoamine, which is in turn determined in part by its uptake from the extracellular milieu via monoamine transporters. These transporters include DAT, SERT, and NET, responsible for uptaking dopamine, serotonin (5-HT) and noradrenaline respectively, and recycling them back for release3-5. DAT, SERT and NET are members of the Na+/Cl- dependent membrane transporter family which also includes other members. These transporters consist of 12 transmembrane domains and intracellular N- and C-termini. Like its counterparts, SERT’s intracellular N- and C-terminal domains are also subject to phosphorylation and protein-protein interactions important for modulating its activity and localization6. SERTs are evidently expressed in serotonergic neurons, and are also expressed in various peripheral tissues including specialized cells of the gut, placenta, lung, blood lymphocytes and platelets6. Anti-Serotonin Transporter (SERT) (extracellular) Antibody (#AMT-004) is a highly specific antibody directed against an epitope of the rat protein. The antibody can be used in western blot, immunohistochemistry, immunocytochemistry, indirect flow cytometry, and live cell imaging applications. It has been designed to recognize SERT from human, mouse, and rat samples. Anti-Serotonin Transporter (SERT) (extracellular)-FITC Antibody (#AMT-004-F). This FITC-conjugated antibody can be used to detect SERT in live cell flow cytometry.